Railway Terminal Map of Chicago. 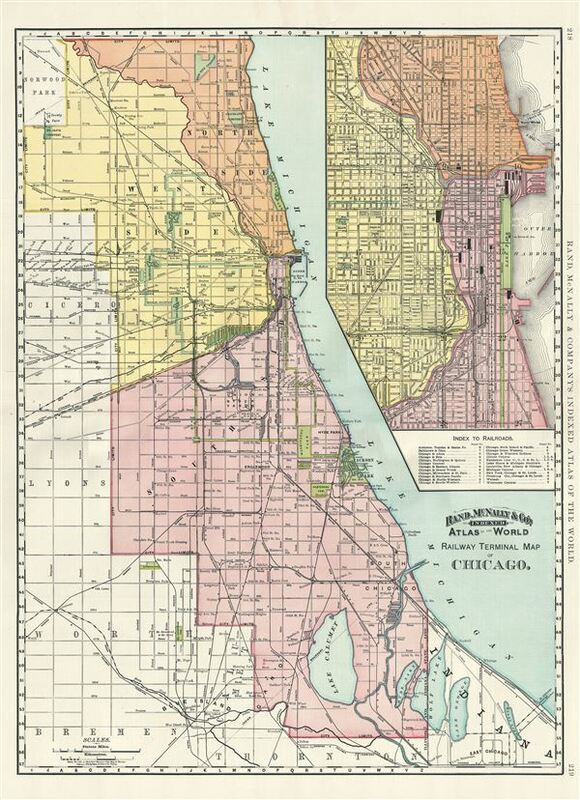 An attractive railway map of Chicago issued in 1892 by Rand McNally and Company. It covers Chicago from Norwood Park to the suburb of Thornton in the south and east as far as Lake Michigan. An inset map of the central city in included in the upper right quadrant. The map illustrates the various railway lines and terminal throughout the city. An index to the railroads in included below the inset map. Selected as a railway hub for most of the American Midwest, Chicago was undergoing a boom period and would soon draw the world's attention as the site for the 1893 Chicago World's Fair, or as it is better known, the Great Columbian Exposition. The map identifies Jackson Park, the location selected for the fair. It also illustrates the Chicago Park System. The 'Park System,' designed by Olmstead prodigy William Le Baron Jenny in 1871, refers to a network of parks and garden boulevards intended to embrace the city in arms of foliage. Many of these parks and boulevards remain today. This highly detailed map notes parks, piers, lakes, cemeteries, railroads, railway stations, and an assortment of other topographical details. Individual streets and buildings are identified. This map was issued as plate nos. 218 and 219 in the 1893 edition of Rand McNally and Company's Indexed Atlas of the World- possibly the finest atlas Rand McNally ever issued.